Oscar Martinez passed away unexpectedly on March 10, 2015. He was born in Pasadena, TX, graduated from South Houston High School and retired from Chevron Phillips. Oscar is survived by wife Donna Martinez; daughter Angela Copple and husband Jeff Copple and their children Bryce, Rylan, and Brayden; daughter Audrey Marlow and husband Wade Marlow and their child Tyler; sister Alma Rosenfelder; and brothers Daniel and Gilbert Martinez. Ursula Nanna died (her preference of words) on January 15, 2015. She fought her battle with cancer on her own terms and with a wonderful sense of humor and courage. Ursula was a passionate naturalist and educator who volunteered with the Master Gardener Program, Texas Master Naturalist – Central Texas Chapter, and with our Angler Education program. She discovered the Angler Education program and became certified in June 2011. Ursula loved teaching angler education to kids and scouts, and their parents. 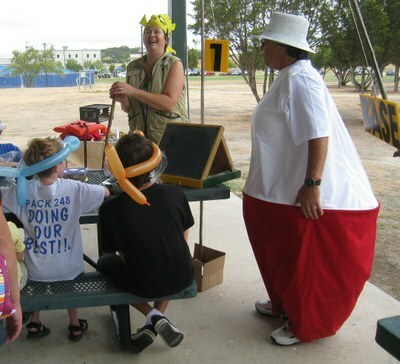 She also recruited many instructors from the TMN program for Angler Ed and was most creative with her angler education classes and outreach, calling her stations “docks” and even created a bobber costume that she wore when teaching kids. Although she never was able to attend an Area Chief meeting, she mentored under Caleb Harris and earned her Area Chief certification in Nov. 2013, an accomplishment that she was very proud of despite her health challenges. Her sister Diane said that she was surrounded by family and friends, and sent a note to thank everyone for the support and love shown to Ursula and herself. Larry Condra of Abilene, TX passed away on June 24, 2014. An avid fisherman and dove hunter, Larry retired from teaching high school social studies in Abilene in 2010, and continued to share his passion for the outdoors by volunteering and teaching with several Texas Parks and Wildlife Department (TPWD) programs, and with Fishing's Future. Prior to his retirement, he bravely chaperoned his high school PALS students across the state several times to volunteer at the annual TPWD EXPO. He was a Angler Education Instructor and Area Chief; a Hunter Education Instructor and trainer for the National Archery in the Schools Program (NASP) and assisted with the state NASP tournaments; and was a regular contributor to the Angler Education Reel Lines Newsletter-his last article is included in this issue. He often taught fishing classes at the Becoming An Outdoor Woman’s program. Fishing’s Future has established a high school scholarship fund in Larry’s memory. 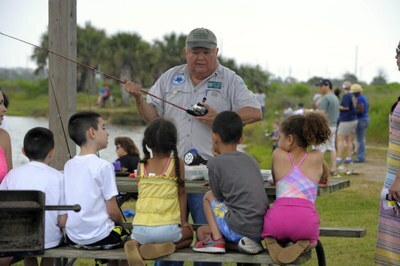 Contributions may be made to Fishing's Future at www.fishingsfuture.org or PO Box 3848, South Padre Island, TX 78597. 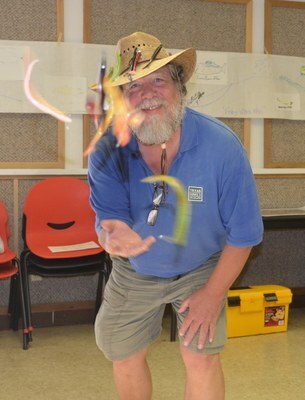 Steve Campbell, Aquatic Education Training Specialist for North Texas, passed away of natural causes July 14th while on a work assignment, doing what he loved best and did best--working with volunteers to introduce fishing to children and their families. Steve started his career at TPWD in 1996 at the Texas Freshwater Fisheries Center in Athens as Education Services Manager. In addition to his contributions in volunteer management and outreach, he was the resident scuba diver for the aquarium presentations at the center. Steve ultimately assumed the position of North Texas Aquatic Education Specialist, which he held up until his passing. Those who worked with him will attest that Steve brought creativity, laughter and lasting traditions to the angler education program. Anyone who worked with Steve at an event would hear him call out “Fish On!” as a youngster gamely pulled up a plastic fish for Backyard Bass. He invented a host of creative and innovative ways to encourage volunteer participation and fellowship, now permanent traditions for volunteer meetings. He co-produced a series of live webcasts to hundreds of thousands of students, creating memorable characters such as “Sherlock Bones,” “Bubba T. Bat,” and “The Custodian of Time.” He trained hundreds of volunteers and coordinated the Tackle Loaner program, placing fishing equipment for ready use at 37 of our state parks and community sites. Prior to working at TPWD, Steve worked as a zoo educator in Victoria and Waco, a museum educator at his beloved Strecker Museum and as a reference librarian in Waco. 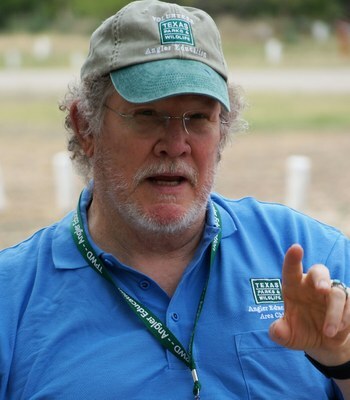 An avid amateur herpetologist, he co-founded the Dallas-Fort Worth Herpetological Society. He was a regular speaker on snakes and reptiles to Texas Master Naturalist chapters in Waco and the Metroplex. We were recently notified by the national Aquatic Resources Education Association that they have named their Outdoor Educator of the Year Award after Steve in recognition of his legacy. The description of the award states that it “recognizes a member’s effort in the area of increasing public appreciation for, and understanding of, the values of aquatic resources and is a leader in providing/promoting angler education and fishing opportunities to diverse audiences in a fun, energetic and enthusiastic manner.” Anyone who knew Steve and his passion for education, understands this award is a wonderful remembrance of him.